Diddy Kong and Fox fighting Rayquaza near a lake. This article is about the Subspace Emissary level. For the smasher, see Smasher:The Lake. The Lake (湖, Lake) is the 6th stage in The Subspace Emissary. After Donkey Kong punches Diddy Kong out of the way of Bowser's Dark Cannon, Diddy lands in a jungle. He is jumping through the jungle and he lands by a vast lake. He sees a crashed Arwing, the same one shot down by the Halberd in the Sea of Clouds level, and goes over to check it out. The lake then vibrates as Rayquaza rises from the lake, and threatens Diddy. Apparently, Diddy violated Rayquaza's territory, so the legendary Pokémon wants to make him pay. Rayquaza engulfs the crashed Arwing in flames with a powerful energy blast. Grabbing Diddy, the Pokémon prepares to finish off the little monkey, when Fox jumps out of the Arwing and uses his Fox Illusion technique to liberate Diddy. Fox lands, his name is shown, and then he gestures to Diddy to help him fight Rayquaza. 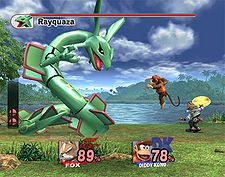 The player has the choice between Fox or Diddy Kong, and Rayquaza must then be fought. In a cutscene after the boss fight, Fox will attempt to leave, but Diddy Kong will try to appeal to him, with no success. Then Diddy Kong decides to drag Fox away with him. Again, the choice between Fox or Diddy Kong occurs, and the level continues. The level is full of day changing doors. At the end of the level, the player will fight a false version of Bowser. After defeating him, a cutscene will occur where the real Bowser comes in and attempts to use the Dark Cannon to turn the two new teammates into trophies. Diddy Kong prepares to fight Bowser, but Fox grabs him and dashes away, knowing they can't defeat Bowser. After beating this level, Fox joins the party. When Fox enters in the opening cutscene, Space Armada plays. During the battle against Rayquaza, Victory Road plays. During the following section of the stage, Bramble Blast plays. When the characters are on the raft in the river, Battle for Storm Hill plays. Following that, King K. Rool/Ship Deck 2 plays. During the False Bowser battle and ending cutscene, Airship Theme (Super Mario Bros. 3) plays. This page was last edited on February 4, 2016, at 09:26.